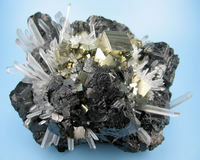 Group of cubic pyrite and quartz on sphalerite crystals. The pyrite crystals are smooth, sharp and measuring to 13 mm on edge. 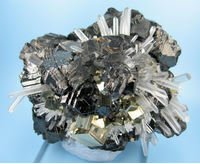 The sphalerite crystals are larger and consist of the matrix. The quartz crystals are colorless, sharp and transparent, measuring to 22 mm in length. Overall size: 100 mm x 90 mm x 55 mm. Weight: 682 g.